The weather this month in New York was more like monsoon season than the start to summer. There have been a few brief afternoons when it stopped raining, and on one of those days about a week ago I scored some gorgeous red rhubarb. I know they say that your perception of food is influenced by the way it looks and smells as much as the way it tastes, and in this case, I find rhubarb to be so beautiful looking that I would have tried to eat it, even if I didn't already know it yielded tasty results. Once known as the "pie-fruit" due to its frequent use in, you guessed it, pies (strawberry-rhubarb pie being one of my favorites), it has found its way into many more creative uses recently. I've been reading about rhubarb bellinis, and rhubarb mojitos (check out Brooklyn Farmhouse's recipe for this one), and even savory dishes with rhubarb (again, the Jamie Oliver cookbook), but as this was my first time cooking it at home I chose the very simple, very common, rhubarb compote. It also has the added bonus of making a great breakfast companion to yogurt, or working just as well on top of some ice cream for dessert. Which is right up my alley seeing how I eat breakfast and dessert interchangeably. There are as many recipes for rhubarb compote as there are food blogs on the internet, but I'll tell you what I did anyways, and what I learned from it. The best thing about this preparation was that it took no time at all to cook. I even made it before work, although to be honest I had cleaned and prepped the rhubarb in advance, when I originally brought it home from the farmer's market. 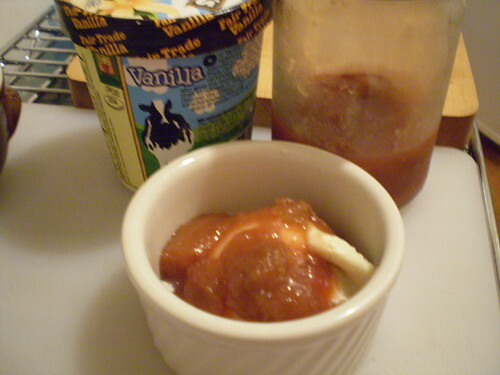 Unfortunately, I made it a bit too sweet, but it was still perfect over vanilla ice cream for dessert that night, and the next, and probably tonight too. 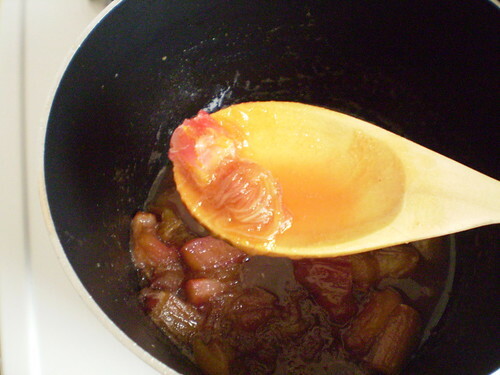 Rhubarb can be stringy, almost like celery if not cooked until soft enough, but since it breaks down so quickly try to avoid over cooking it, otherwise you'll end up with something more of a jam consistency. 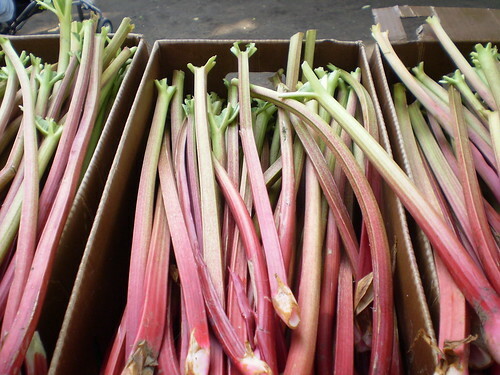 Then again, rhubarb jam is also a treat so don't really fret about it. I chose to flavor the compote with the juice of an orange, although the zest would have been nice too, if you want a stronger orange flavor. I also added some fresh ginger, to give it a bit of a kick, which contrasted nicely with the sweetness. I didn't add any additional liquid other than the juice of 1 orange, but you could certainly add some water if you'd rather have more rhubarb syrup at the end. I was after a thick consistency and that's what I got. I mistakenly added about 1 1/2 cups of rhubarb, where I think I should have added about 1 1/2 lbs., which is why my rhubarb to sugar ratio was off. No worries it really was delicious as an ice cream topping, and if I had had some angel food cake, or biscuits, it would have been on top of that too. 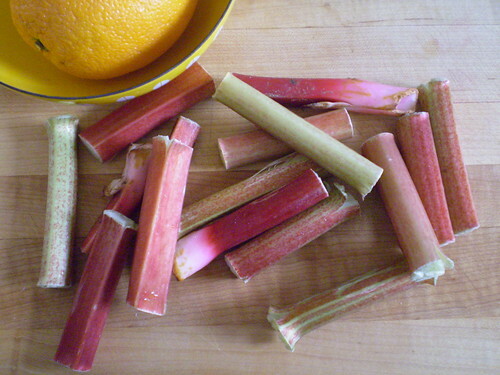 Meanwhile, I luckily have some rhubarb left due to my faulty arthimetic, (which will probably end up in a cocktail) while I sit home waiting for the sunshine to return. Rhubarb Compote I think this recipe could handle lots of different variations, really whatever you have on hand will work. I had an orange, so that's what I used, but lemons, or additional fruit would be nice too. Place all ingredients into a heavy pot and set to simmer on medium-low. 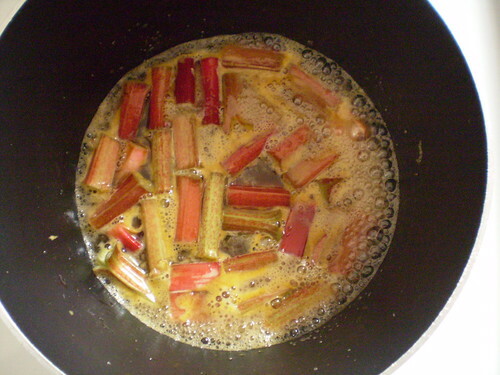 In about 4-5 minutes you should see the rhubarb start to break down and get juicy. Simmer until it is your desired consistency. Probably no more than 10-15 minutes. Put on top of anything that could use a sweet accompanyment.